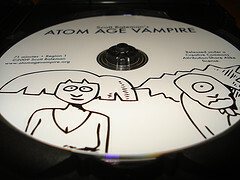 Buy Atom Age Vampire today for only $10! Including shipping! What? I know! Bonus features include: a menu that says, "Play Movie." WOW!!! Plus, I'll autograph it for you, if you want. Or draw a sketch or something. Whatever's cool with you. 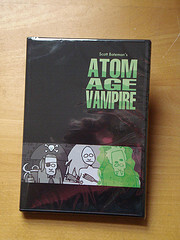 Whatever meets your particular Atom Age Vampire needs. I'm here for you. Just leave instructions when you pay with PayPal. You can see the trailer and a clip on the video page. Bill Corbett (MST3K, Rifftrax) says, "Very funny! In the MST3K tradition." John Kovalic (Dork Tower) says, "The "B" in Cecil B. DeMille stood for "Bateman." Who knew?" Animation Magazine calls me "A rising star of animation." Author Bob Harris (Prisoner of Trebekistan) says, "There are two mad geniuses at work in Atom Age Vampire: the one in the movie, and Scott Bateman himself. The result is genuinely funny." NOW how much would you pay...? Still only ten bucks! Damn, Slappy! View the original film online!